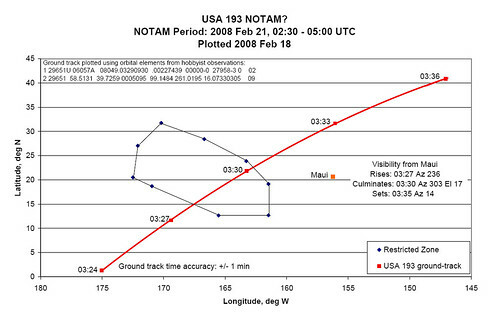 A "CARF" (Central Altitude Reservation Function) designation indicates a NOTAM intended to keep commercial and private flights clear of military operations, and SFC-UNL means the height band of this warning zone reaches from the surface to "unlimited" altitude – in other words all the way into space. The UTC time referred to is the same as UK time, so the zone exists from 0230 to 0500 on Thursday morning for British readers. As will be evident, the barred area is a cool 1,400 miles long and nearly 700 miles wide at the surface, giving the US Navy plenty of elbow room to fire their interceptor missiles up into the descending spacecraft’s path. Google Earth kmz file by Alan Clegg is worth a look. This entry was posted on Tuesday, February 19th, 2008 at 6:50 pm	and is filed under Front Page, Observation, Satellite TV. You can follow any responses to this entry through the RSS 2.0 feed. You can leave a response, or trackback from your own site.